Every so often a project comes along which is kind of special. Special not just because it’s going to be something unique and beautiful, but because it holds a huge amount of sentiment for the client, and for us. 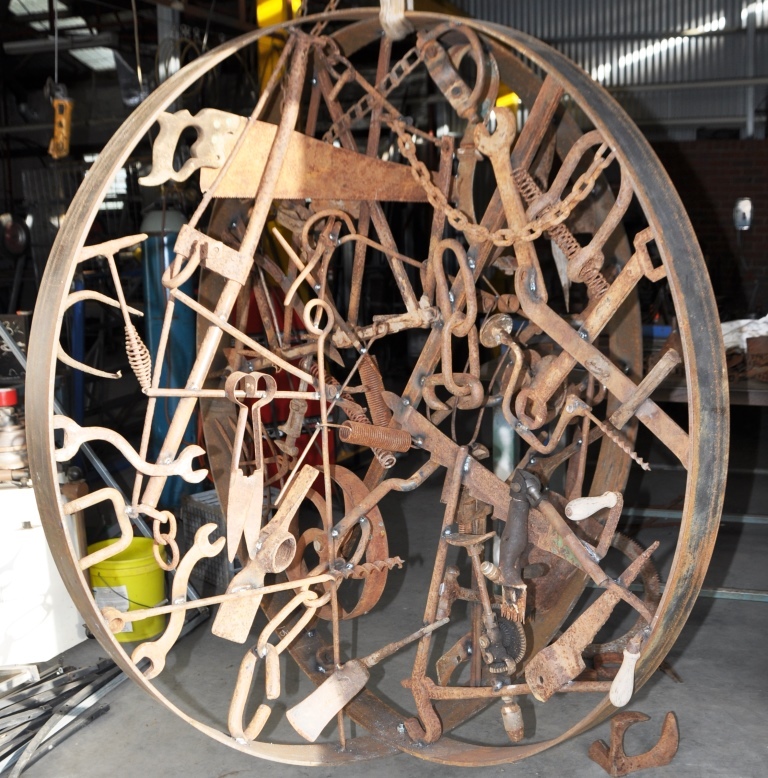 This metal sculpture was one of those projects. Something that evokes memories in so many ways. 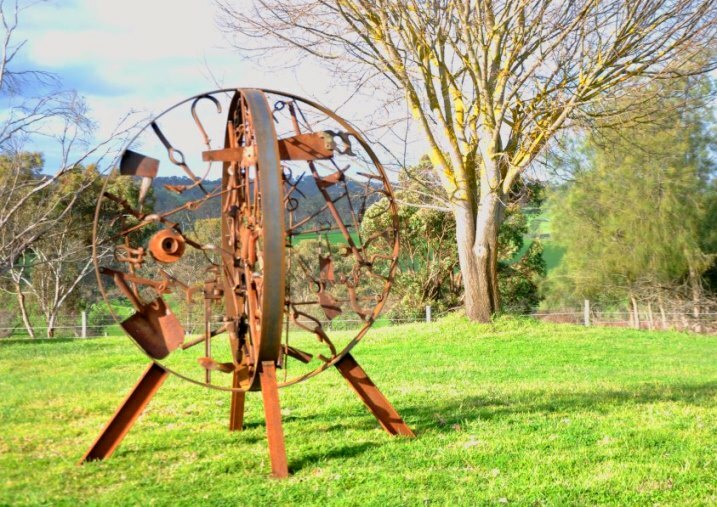 This memorial sculpture made up of a collection of farm implements and tools is dedicated to a special father. It also evokes memories of the farm where his daughter grew up. Andrew received a phone call from a lady just outside of Mt Barker in the Adelaide Hills. Her father had died a while ago and she had a collection of his old shed and farm tools from the family farm in Victoria. It was all she had left of the special place she had grown up and also of the ‘things’ which had been owned and used by her father. She wanted to create a memorial sculpture as a tribute to her special farmer Dad. Andrew sensed that this project was something that meant more to our customer than just the making of an ornamental garden sculpture. He discussed how the sculpture could be made on a practical level and she suggested that he make up two very large rings within which the tools could be mounted. He then invited her to be part of the project by further suggesting that she arrange the items as she wanted them. She could then take photos so he could see where to weld things in place. He wanted it to be her project as much as his. Back in the fabrication workshop, he made up two large rings and left them at the client’s Nairne property, so she could work her magic. I suspect it might have been a bit of a cathartic process for her, possibly making the sculpture even more special. The rings, photos, tools & implements were delivered back to our workshop and with an air of excitement and anticipation, the magic began. Unfortunately the recreation of the composition didn’t quite work. Andrew called the client and asked her come out and together they rearranged the items. There were still some gaps which needed to be filled to keep the items in place. By coincidence we happened to have some old harrows so pieces of these were used as fillers to balance the design. As the piece had so much emotional value, and the client mentioned that her children and grand-children would be interested in the history of the sculpture, Andrew decided that it should also be something that was tactile. Something people would enjoy touching, moving and playing with. He welded up some tools so they still had sections which moved. The handle on the hand drill rotated as did a large cog wheel, loose chain links would clink and the sheep shears swivelled around. These were all items once regularly used and they were not condemned to being totally frozen. The sheep shears and hand drill on the bottom right still move. When the sculpture was delivered a relative of the client was there and it turned out he was blind. He took great delight in having each piece described to him. Andrew was very touched when the blind relative ran his hands over the pieces, excitedly saying “I remember that, I remember that”. Some items were welded in just as they were last used, or abused. An old axe with it’s broken and splintered wooden handle appears to pierce the hard circular frame within which it now sits, just as it would have when Dad took a rest between chopping up the firewood. The sculpture is not just a collection of castaway tools though. Some implements, although very rusty were still in good working order. As much as it may have been a shame to weld them in, the sculpture represents not just the old and useless things but those which still had value to their original owner – till his dying day. The next step was to finish the piece off with a base which would not only support the weight, but also look in keeping and in proportion to the globe. The client left this aspect to Andrew’s discretion and was happy with the outcome. The steel sculpture will be treasured by this family for generations. The historical collection of farming and shed implements will no doubt be a point of conversation as the family reminisces, and tell stories about ‘Dad’ and the farm. Stories which will hopefully be passed down along with the steel sculpture, from generation to generation. Note: This sculpture was made as a one off commission. Should you like to have a similar sculpture made you’ll need to collect some old pieces of farm machinery & tooling as we’re unable to source them.